Salvation And Survival: Will Enforced Vaccinations Become The Law of the Land? Will Enforced Vaccinations Become The Law of the Land? The state of California appears to be at the forefront of forcing a showdown between those who are pro-vaccine adherents and those who maintain it should be freedom of choice. I'm afraid that my "conspiracy" hackles are once again rising as this debate heats up. Supposedly the rush to law for mandatory vaccinations centers around an outbreak of measles, which originated last winter at Disneyland. There was an immediate panic over all the deaths that would ensue, as infected children returned to their home cities and states. The media did everything they could to fan the flames of fear and promote nationwide vaccinations among our country's school-age children. There was all kinds of media buzz over "the outbreaks" of measles across the land. But I could not find one report or statistic about run-away numbers of infected, or deaths. Only one report said, "Measles count at 59 and rising" ... but that was nationwide! We had that many in one semester of my elementary school in the 1960s. And if I recall, no one died and no serious health issues ensued. Is it all a sham for forced inoculations? If so, California is Ground Zero for amending state legislation which would require children at public and private schools to be vaccinated unless a doctor determines they should be exempt for medical reasons. But there has been some measure of success in stopping the government from forcing children to be vaccinated. 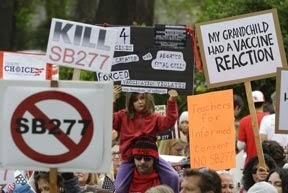 As of this last week, California SB277 has stalled, and the bill's author was given a one-week delay to alter the legislation in order to make it more presentable to legislators. At the heart of the debate are the issues of personal freedoms versus public health. Some lawmakers were concerned that the bill would deprive unvaccinated kids of a constitutionally required education by barring them from schools. And choosing to homeschool your children would not necessarily protect your children from the long arm of this law. Some lawmakers said the way the bill is written, children who are homeschooled would be barred from group learning with other homeschooling families. It appears to me that this would be government "strong-arm" tactics. By refusing to educate non-vaccinated children in the public schools, and by putting roadblocks in the way of home-schooled kids, the government is attempting to force it's own medical mandate on its citizens. Not only is this a personal choice issue, but many parents are skeptical of the added chemicals in vaccines. They simply do not trust across-the-board vaccinations because the government "says so". Just in case the "scare tactics" of the measles outbreak don't work, pro-vaccine advocates aren't above pitting parents against each other. Children who cannot be immunized due to adverse reactions (those being treated for cancer, for instance) would be required to stay home for 21 days because another parent refused immunizations based on religious or anti-vaccine positions. Do you see how it works? Those who choose not to vaccinate (for whatever reason) are seen as the villains -- if everyone would just vaccinate their kids, then the state wouldn't have to quarantine anyone. So, here's how that thinking goes ... I don't really care or worry about what might be in those vaccines. I think you should vaccinate your kids so it doesn't interfere with my child's education. We should just all blindly follow what the state tells us. So we should all be watching California very carefully. Those of us born with the "suspicious gene" will find it ironic that due to an inflated sense of alarm over a few cases of the measles last December, we now find, just a few months later, a bill before the California legislature that seeks to make vaccinations by the State mandatory. If they are able to get this legislation passed, then it will become precedence for amendments to the law in the other 49 states. I do not think parents are being over-paranoid to mistrust vaccinations. When one considers the government's interest in genetic engineering, and private pharmaceutical companies being funded to research nanobot medicine -- not to mention technological advances towards transhumanism -- one would be foolish to indiscriminately vaccinate your child. As the California mother said, it is about informed consent ... the American people should become knowledgable on this subject, and they should demand their right to decide for themselves and their children. Stay vigilant! Addendum: Public schools in Spokane, Washington are invoking a law that requires proof of vaccination before students are allowed to remain in the classroom. Those who oppose the compulsory vaccinations must provide a signed waiver from a health care professional or be able to prove that they challenge it on religious grounds. Coming soon to a school near you! Revelation 18:23 "... and all nations were deceived by your sorcery." [ The root Greek word for "sorcery" is actually pharmakeia (to administer drugs)].